Blue Hill and Bar Harbor are two of Maine’s most scenic villages – it’s now wonder you’ll find several exceptional Art Galleries and Art Studios here. If you are planning to visit a Maine gallery, call ahead for hours. Many Maine art galleries are closed for the winter except by appointment, and many are open selected days and hours the rest of the year. 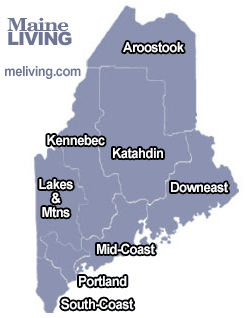 To feature your Maine art gallery, contact us. Featuring contemporary paintings, ceramics, glass, mixed media, photography, art & fashion jewelry, and outdoor sculpture from established and emerging artists. Open May -December. Showcasing the paintings, prints, and graphics of Russell DAlessio. Specializing in images of the landscape of Maine and Quebec.